One of the greatest benefits of shopping at SportsUnlimited.com is how fast we’re able to ship you products. As a small business competing with some of the biggest stores in the world, we have to do everything in our power to make our customers happy. One way we’re able to maintain our extremely high customer satisfaction ratings on Google and Trustpilot is by shipping out orders we receive the same day we receive them. When an order gets placed at Sports Unlimited, we quickly approve it (if it is valid) and then gather the items from our warehouse. Those items are verified as the correct ones that were ordered, and then we package them and ship them out. Of course, as a small business, the people doing those jobs don’t work 24 hours a day and our shipping carriers only pick up packages at certain times. Because of that, we have determined that to make sure we can guarantee that your order will ship out the same day, we need that in-stock order to be placed by 3pm ET Weekdays. Just because it ships the same day, does not mean it will deliver the same day! Once the package leaves our warehouse, we can’t control how fast it gets to you other than shipping it via the shipping method you’ve selected upon ordering, but we continue to provide customer service throughout. For more information visit our our Shipping Time page. 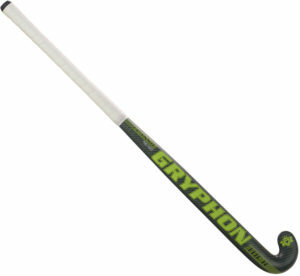 Which field hockey stick is best for my position and/or skill level? With the vast amount of options these days, it can be difficult to choose which field hockey stick to purchase based on your position and skills. Here we break down which sticks are best for each position or skill level and why, and we’ve included our stick recommendations for you to check out. It is recommended that a beginner player use a stick with a standard bow shape and no larger than 20 millimeters in size. 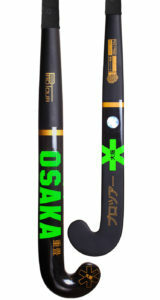 Beginner field hockey players should choose a stick with a wood or fiberglass composition. Wood sticks will provide the most forgiving feel and the best touch on the ball, while fiberglass sticks also provide an excellent first touch with a lightweight feel. Having a flexible stick will help them learn the fundamentals, so they can get accustomed to trapping the ball without too much rebound off the stick. It should feature a larger hitting surface to help players get a touch on the ball. A maxi toe or hook head shape will offer you the largest surface area, ensuring you make great contact with the ball when trapping it or driving it down the field. When choosing a stick, you must also consider the bow size and shape. It is recommended that a beginner player use a stick with a standard bow shape and no larger than 20 millimeters in size. This will help him or her learn the basics while maintaining excellent control over the ball. A larger size or later shape will more easily cause the ball to pop up in the air and earn yourself a dangerous play whistle. A standard bow is very versatile and can be used on offense or defense, making it the ideal stick shape for beginners who have yet to discover which will be the best position for them. 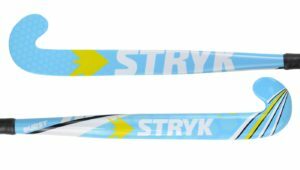 We recommend buying a stick that has a higher fiberglass content since carbon can be more brittle in a compound stress way. When searching for the perfect stick, defenders will often choose heavier sticks with the weight concentrated in the head of the stick. This allows them to make stronger block tackles, and the extra weight will help generate more momentum when hitting the ball down the field. Also, often times, defenders will buy slightly longer sticks than their player height recommends to give them a little extra reach when tackling and jabbing at the ball. Since defenders see a lot of stick-on-stick contact when tackling their opponent, they require a stick with a lot of durability. We recommend buying a stick that has a higher fiberglass content since carbon can be more brittle in a compound stress way. Including aramid in the composition can also help improve the strength and durability of the stick, and it dampens the vibrations felt in the handle of the stick for less sting in your hands. In addition, we recommend choosing a stick with a maxi toe as it provides the largest sweet spot, allowing you to make better contact with the ball when hitting or trapping it. The attribute we find most important in a midfielder’s stick is control. Midfielders are responsible for controlling the ball and delivering it safely to the attackers to put it in the back of the net. They are also sometimes trying to score themselves, or they are trying to stop their opponent from advancing down the field. Therefore, a lightweight and well-balanced stick with a lot of versatility is a must. The presence of aramid in a stick’s composition can make all the difference. Aramid dampens vibrations to keep the ball from rebounding too far off the stick, allowing you to have great control when trapping the ball and dribbling. It also adds durability to the stick, helping to prolong its life even with all the stick-on-stick contact it sees when making defensive blocks and tackles. Since midfielders play with the defense and the offense, they need a lightweight stick that can keep up with the speed of their game and offer the necessary precision for ball handling and passing skills. A midi toe provides a well-balanced feel that’s great for all around stick skills, especially reverse stick work, and it provides a decent sized sweet spot for quickly trapping the ball and passing to your teammate. A standard or mid bow size (19 – 23mm) is recommended for midfielders because of its versatility, but any shape you are most comfortable with can be used. Offensive players, or forwards, prefer to use lightweight sticks that are well-balanced, giving them the necessary agility to move the ball around their opponent. A lightweight stick is not only more effective when dribbling, but it allows you to swing your stick faster and quickly get a shot off before the defender can intercept it. A midi toe also helps to enhance a forward’s abilities. The toe is smaller in size and lighter in weight, and it increases maneuverability and offers more precise ball control. It allows you to quickly and easily move the ball from side to side to dodge your opponent and dribble towards the goal. A forward demands power from his or her stick. They must be able to generate extreme power when shooting and when passing to an open teammate across the field, which is why they need sticks with a high carbon content. The higher the carbon content the more powerful the stick will be and the harder it will be for your opponent to stop you. This added power will also improve your drag flicks and aerial skills to enhance your 3D game. The attacking position is defined by speed, accuracy, and precision, so their sticks should be too. The most important element of a stick that the aerial player should consider is the shape and size of the bow. 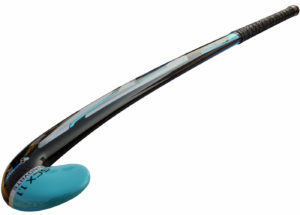 A stick that bends closer to the head will allow you to get under the ball more to perform aerials and lifts. A low bow or late bow is most recommended since their point of maximum bow is the closest to the head the FIH will allow (200mm). Also, the more the stick bends the easier it will be to execute 3D skills with precision and accuracy. A large bow, such as a 24 or 25 millimeter, will help generate high velocities when drag flicking. Another feature that has recently become more popular is incorporating a slight concave channel onto the face and shaft of the stick. This helps to channel the ball where you want it and keep the ball on your stick as you lift it up for aerials. If you’re uncertain which position you will be playing when purchasing your stick, it would be best to buy a medium-weight stick that’s versatile and can be used in any position. For the first time in Sports Unlimited’s history as a major equipment retailer, football shoulder pads have been added to the Sports Unlimited branded product roster. 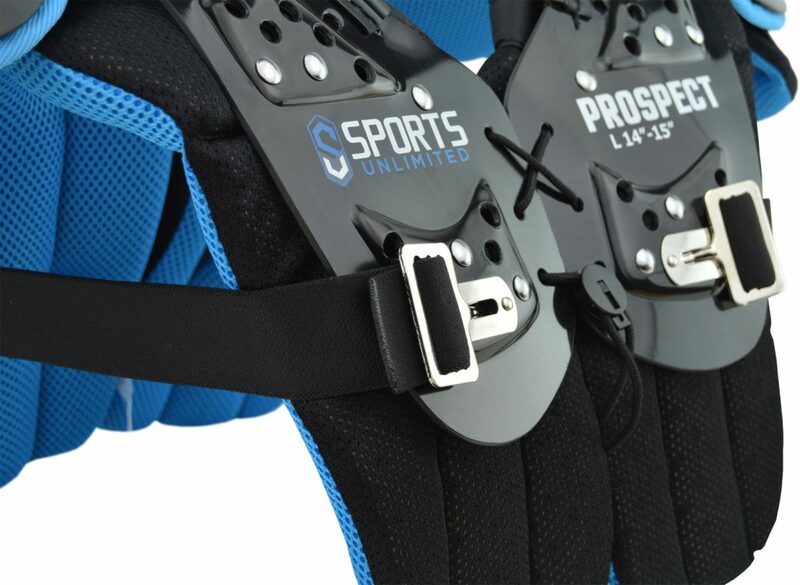 With so many years of experience selling the best shoulder pads in the world from companies such as Schutt, Riddell, Douglas, Gear Pro Tech, Xenith, X-Tech, and more, 2018 is the time to add Sports Unlimited to that list of equipment brands. 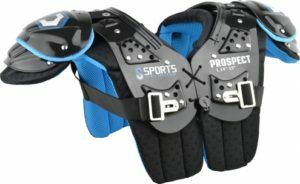 Using customer feedback, extensive football gear knowledge, and an in-house design and testing team, the PROSPECT ($42.95) for youth and PROSPECT PRO ($114.95) for adult have been released. Take a look at the designs below. The 30 years of experience Sports Unlimited has had as a retailer helps it break into selling its own products because using the millions of interactions directly with customers and seeing the successes and failures of selling other brands provides a deep knowledge of products across the category. As a small business in America, it takes creativity and the ability to change who you are to compete with the biggest stores in the world and going from a sports equipment retailer to a sports equipment brand and retailer is a necessary move to combat those challenges. 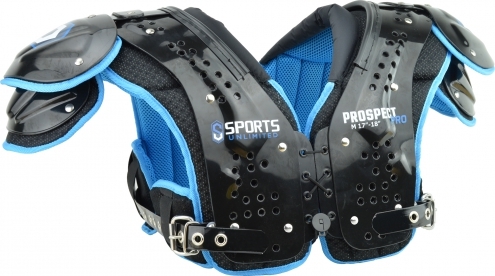 The goal for developing the Prospect line was to create superb quality, lightweight, and cheap football shoulder pads that would stand up against the already well-known brands in the industry. Football is an expensive sport to play with equipment to buy for every part of the body and dealing with so many players, parents, and coaches over the years, it’s important to provide these people that are passionate about football an option that is able to balance on the line of quality and price. If someone can afford $600 shoulder pads, a $600 football helmet, cleats, pants, girdle, gloves, jerseys, back plates, among other equipment, that’s fantastic (and Sports Unlimited can provide it), but that isn’t true of the vast majority of football players and parents. The game should be accessible. Gear should be accessible. And that shouldn’t come at the cost of quality or safety. The Prospect and Prospect Pro for youth and adult aim to make the game more accessible through low costs, but also without being ‘cheap’. The Prospect Pro uses a flat pad design, dual density foam, and stainless steel hardware among other great features that have had first users saying it is “amazingly light, breathable, comfortable, and [gives] the best range of motion”. The youth pad is built for all positions, uses an extended body length design with double layer EVA foam. 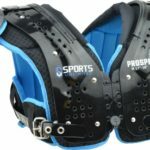 As always, the best place to look for more features and specifications for these football shoulder pads is on the product pages themselves at SportsUnlimited.com. If you want more information about the differences between the adult and youth versions of these shoulder pads you can check out our comparison page here: Adult vs. Youth Shoulder Pads Comparison. For the past several years, Schutt has followed a similar pattern when it comes to releasing new football helmets: take a recognizable helmet shell and tweak the padding inside. While this strategy hasn’t exactly changed the face (or head) of football, it has strengthened Schutt’s position when it comes to helmet safety. The Litchfield, Illinois-based manufacturer now owns five of the top six ranked helmets in the Virginia Tech Helmet Study and has six styles that have earned five star rankings. Those numbers figure to increase in the 2017 study with the recent release of the Schutt Air XP Pro Q10 Adult Football Helmet. Following on the heels of 2016’s new offering, the Vengeance Z10, Schutt has taken its Helmet Stabilization System and applied it to the classic Air XP shell in the Q10. The system uses both internal and external stabilizers around the jaw area to give players a more locked in feel. Special jaw pads, also used in the Z10, work in unison with newly designed facemasks to provide addition protection to the side of players’ faces by extending above the helmet shell. Other than the shell design, the biggest difference between the new Q10 and last year’s Z10 is in the front padding. The Z10 uses traditional foam wrapped in a faux leather comfort pad, while the Q10 has shifted away from that and put TPU throughout the entire helmet, including underneath the newly designed front pad. 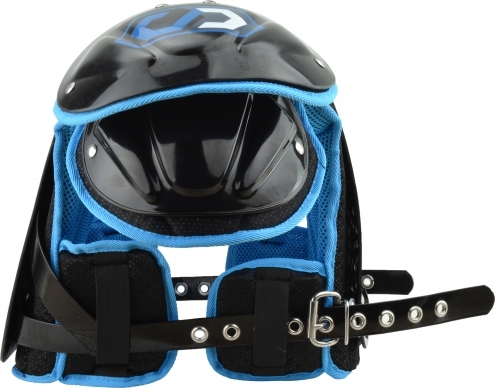 The lighter padding brings he helmet’s weight down to 2.95 pounds without a facemask. That weight doesn’t increase much when you add an included titanium facemask in your choice of style and color. While the Q10 has yet to be rated by the Virginia Tech study, Schutt’s track record shows that if they’re releasing a new helmet, it’s sure to be given a 5-star rating. Look for the Q10 to start popping up on NFL and college fields during this spring’s mini camps or get your own on SportsUnlimited.com today. There’s no better place to find a Christmas gift for that special football player in your life than here at Sports Unlimited. We offer the largest in-stock selection of football gear anywhere online and we’re ready to ship it to you with plenty of time to get it under the tree by Christmas day. Here are some of our top picks this holiday season. A Riddell SpeedFlex under the tree will make any football player’s Christmas. If you’ve been watching football in the last two years – and we know you have – you’re probably familiar with the SpeedFlex. It’s the football helmet with the unique cutout panel in the front of the shell that’s recognizable from the youth field all the way up to the NFL. Aside from its stunning aesthetic, the SpeedFlex is one of the most protective helmets on the market with a specially designed facemask and chinstrap working in unison with the helmet’s shell to keep you safe. The Schutt XV HD Shoulder Pads could make a nice surprise gift. Choosing the proper football shoulder pad can be a complex task, but it’s tough to go wrong with the Schutt XV HD Shoulder Pads. Lightweight and protective, the XV HD line is one of the most popular we offer with removable clavicle channel to allow you to customize the fit. 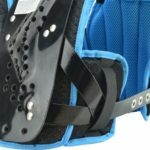 Whether you’re shopping for quarterback shoulder pads, lineman shoulder pads, pads for skill players or all-purpose shoulder pads, the XV HD line has a version that’s right for you. The past year or so has been tough on linemen. With the NFL, NCAA and some states banning the popular Big Grill facemask, the big guys have had a tough time choosing their look. But the facemask companies have adapted to the new rules and came up with facemasks built to intimidate. Riddell now offer the Riddell S2BDC-TX-LW facemask that has a similar look to the ultra-popular Big Grill 2.0. Schutt also took note, adding a Schutt ROPO-DW Pro facemask style to fit their Vengeance models. The titanium construction keeps the weight down, making it easier to keep your head up during play. Nothing completes the look of a football helmet like a visor and while there are plenty of options on the market, few compare to the Oakley Eyeshield. The most popular football visor, Oakley has tweaked the optics to perfection giving you a clear view of the field and keeping opponents fingers out of your face. With a variety of sticker colors, you can customize the visor to your own team specifications. The clear version is legal in all leagues, making it the safest gift option, but a dark version like the 20 percent grey visor could also do the trick. A custom colored Douglas Back Plate protects players. Extra protection is always a good thing, making the Douglas Back Plate an easy choice for anyone looking for a last-minute gift. Made in the USA by one of the most trusted names in the football business, this back plate is one of the top accessories in the game. It’s available in a wide range of colors to ensure you can match your team’s colorway and attaches to almost any brand of shoulder pad. You can also opt for a four-inch version of the back plate for smaller or youth players. I remember waking up Christmas morning so excited to see what Santa brought me. What kind of new gadget or toy would be my favorite? Crossing my fingers that it wouldn’t be clothes! You know, when you’re 8, 9 or 10 years old the last thing you want is a new pair of PJs. So parents and grandparents here is your guide to ensure you are the cool parent that gets something your boys will love. The Space Scooter X580 will bring smiles on Christmas morning and provide hours of fun throughout the year. I used to love playing table hockey back in the mid-80s. The problem with the hockey games then was the puck always used to get stuck behind the net where you’re player couldn’t get it. That’s no longer the case with the Stiga Stanley Cup Table Hockey Game. This game is well built. The players all move back and forth and spin in circles smoothly. The Stiga Stanley Cup Table Hockey game updates a classic favorite. The Fantom-X Snow Sled makes snow days great again. The Park & Sun Tetherball set allows you take a fun game with you wherever you go. The Under Armour 395 Junior football is soft and easy to grip. Any of these gifts are ones that will bring a smile to a little boys’ face on Christman morning. They are also toys that are best played with two people. And isn’t the fun of Christmas playing with your kids and grandkids?!?! If you’ve been to an ice hockey rink lately, odds are good you’ve seen a Grit HTSE Hockey Tower Bag. You know the one. Well made and durable, rolling wheels, stick holders on the side and plenty of space for all the gear. Much more than a regular hockey bag, the Grit Tower Bag is truly a locker room on the go. It’s the best ice hockey bag on the market and it’s almost unfair to compare it to conventional hockey bags. What Grit has done has built a portable hockey locker that you can take anywhere. The Grit hockey bag is at is best when it’s standing straight up – a break from tradition with normal bags. It essentially contains shelving inside that gives you space to put all your gear. It’s great for when you get to the ice, but it may be even better when you’re leaving the house and making sure you have everything with you. The top shelf contains compartments for your skates and helmet. 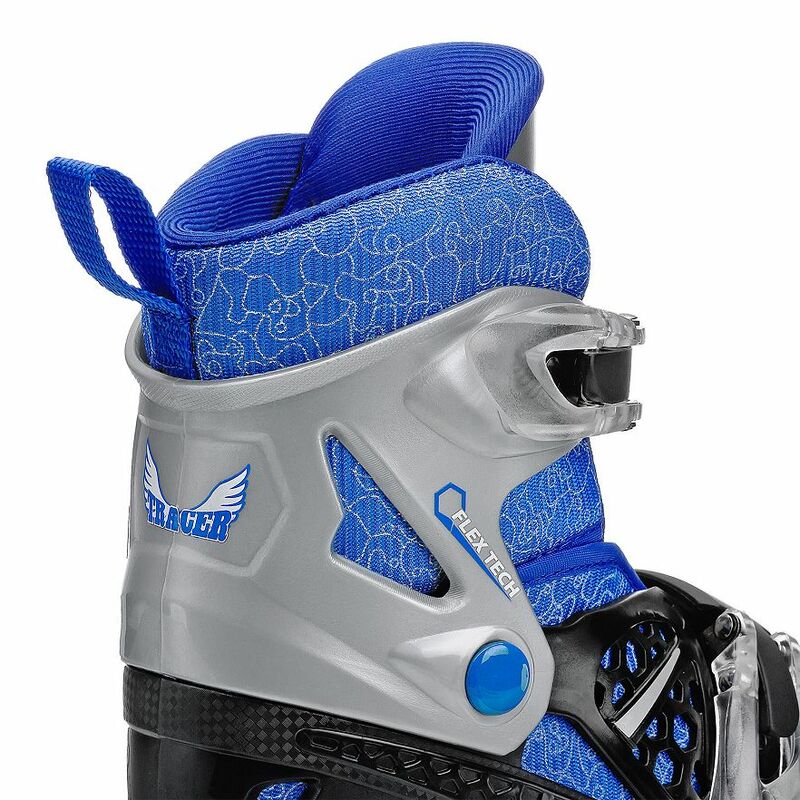 The second level has plenty of space for your elbow pad and gloves, while your shin guards, shoulder pads and hockey pants can easily fit below. Everything is clearly in view to leave little doubt that you’ve got all the equipment you need for a game or practice. No more showing up with one skate or elbow pad because you assumed the other was stuffed beneath your pants. The simple organizational elements will make sure you’re prepared every time you leave the house. Ventilation holes in the plastic and a mesh back keep your Grit bag from smelling like a locker room. Another great feature of a Grit hockey bag is its air flow, essential for keeping your portable locker from smelling like, well, a locker. The reinforced plastic that makes up the back of the bag has holes punched in it and a mesh covering to promote air flow. It also features several removable mesh compartment and two mesh compartments on the side that are great for holding a pair of slides, socks or any other items that need to be aired out before or after play. A zippered front pocket increases storage space and includes straps for two water bottles with enough room left for tape and other small personal items. Another extra feature is a carpeted pull out piece for standing on while you’re changing. It beats standing on a wet, slippery floor. Two stick holders on the sides of the Grit hockey bag allow you to transport your main stick and a backup very easily. There’s even an attachable shoulder strap if you prefer to go old school and not take advantage of the wheels. Available in a wide array of colors mirroring the schemes of the NHL’s top franchises, the Grit Hockey Tower Bag is a great choice for anyone looking to find a better way to get their gear to the ice. The bag comes in both a 33″ version and a 36″ size, with additional options for large goalie bags and medium goalie bags. There’s even a Grit Youth Hockey Tower Bag available. Check out ice hockey equipment bags from Grit and other brands at Sports Unlimited today! As a father of three boys ages 11, 8 and 5, I know how fast boys’ feet grow. Roller Derby has a great solution for fast growing feet. 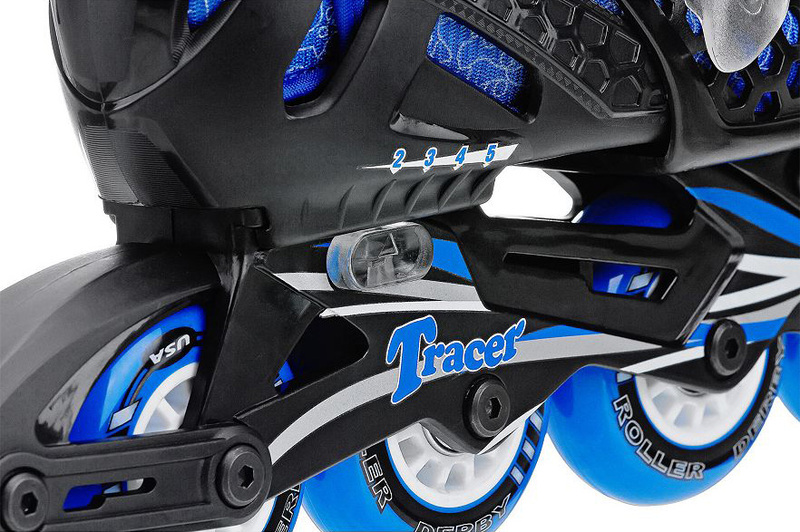 The Tracer skates grow with your kids. They are available in two size runs; Small (12-1) and Medium (2-5). It’s like owning multiple skates. The push button makes adjusting to the perfect fit easy. This pair in particular is a great buy at around $39.99. The deluxe liner is washable to get the smell out and the locking cam lever buckles make it easy for your kids to get them on and off all by themselves. They love the freedom. Features excellerator 608ZM Chassis, 70MM urethane wheels, and locking cam lever buckles. 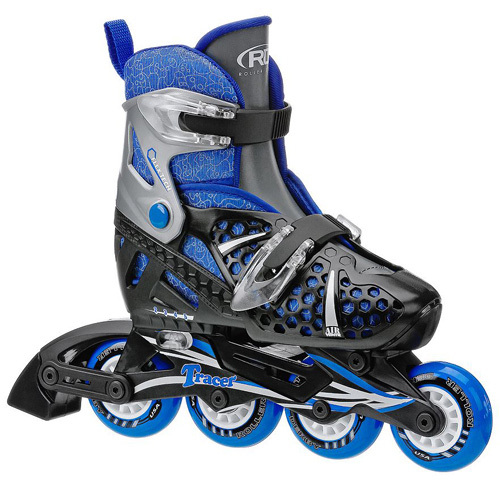 If your kids are older and you need something a little bigger check out a wide selection of youth inline skates for all sizes. Girls too! Developed in the Netherlands, the Space Scooter X580 is one of the most unique scooters on the market. The scooter craze is real and as Christmas is approaching, now’s the time to get in the game. One of the more innovative models – the Space Scooter X580 – takes a traditional cruising scooter and adds a twist. Instead of the traditional kicking needed to propel you forward, Space Scooters allow you to keep both feet on the deck and use a pump and go motion to keep you on the move. The unique design comes from the Netherlands where one in three kids own a scooter. Instead of flooding the market with more of the same, Space Scooter wanted to do something different – help people get around while also keeping them active. Enter the pump and go action, which allows you to pedal the scooter. The X580 can also adjust to a normal mode where you can still use your foot to move you forward. A unique pump and go action makes the Space Scooter X580 great for getting around while getting exercise. The X580 has built in safety features that make it great for kids. The sturdy board is built to hold people up to 200 pounds and it’s fully ASTM compliant. A wheel safety lock prevents it from rolling backward, keeping you upright and on the move. Fitted with a hand break and kickstand, the X580 is easy to store. The scooter simply folds up to fit into tight spaces and to make it easy to carry. The X580 is available now at SportsUnlimited.com along with a wide range of other scooters. 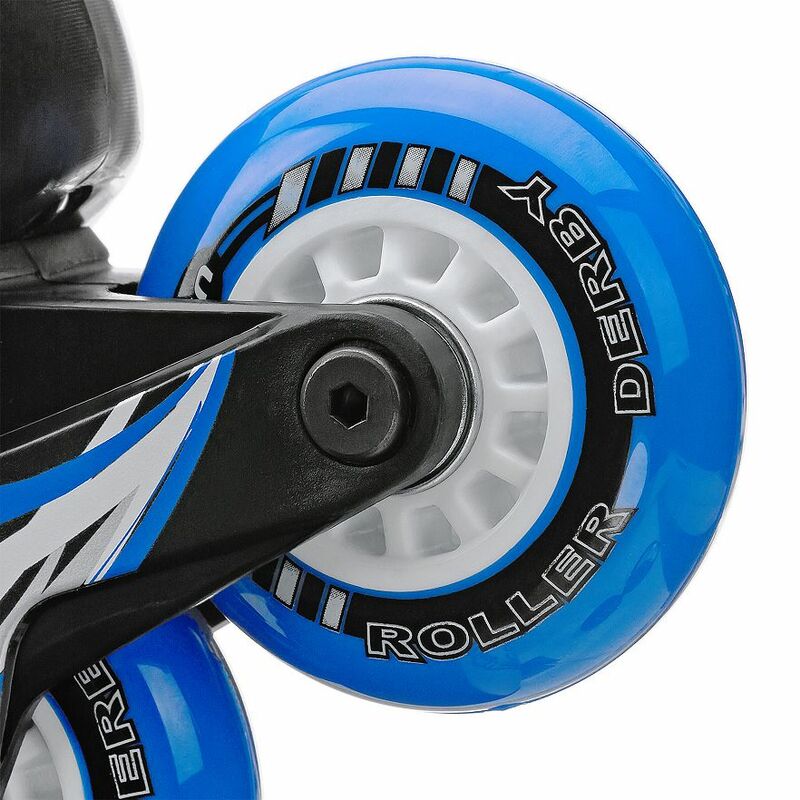 You can also check out the junior model, the Space Scooter X360, or the exclusively designed Space Scooter Lionel Messi. With over 1 million sold worldwide, the Space Scooter already has a devoted following. The Christmas season is a great time to join in the fun! As Corey Kluber, Andrew Miller and Cody Allen were mowing down hitters one-by-one during Game 1 of the World Series on Tuesday night, you had to wonder… maybe it had something to do with the target. If the All-Star System 7 Catcher’s Gear set is good enough for Indians catcher Roberto Perez, then it’s good enough for you. Behind the plate was unquestioned Game 1 hero Roberto Perez, clad in his All-Star Catcher’s Gear, managing his pitchers through the most important game of the season. The Indians catcher watched as they struck out 15 batters, cooling off a red-hot Chicago Cubs team that had just plated 23 runs in three games to reach the Fall Classic. Perez provided the pop on offense too, clubbing a solo shot in the fourth to fire up the Cleveland fans early and adding a three-run blast in the eighth to essentially put the game away. Was it in the gear? Perez was wearing perhaps the best catcher’s set in the game. The System 7 is chosen by catchers across the highest level of baseball for its incredible level of craftsmanship and exceptional durability. 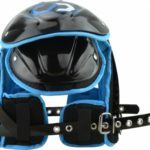 The two-toned helmet is both stylish and lightweight, while the chest protector provides a consistent rebound. While his pitchers weren’t missing the zone often, Perez had the support of triple knee protection in his shin guards to block errant balls. 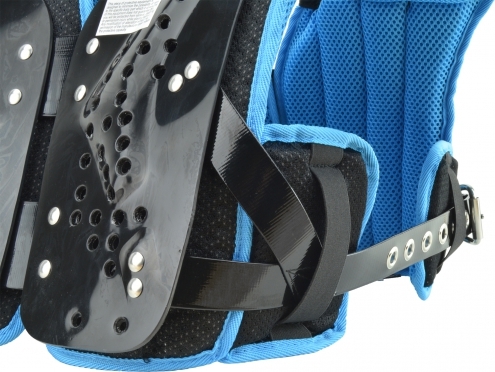 A four-point harness system allows for the best fit and oversized perforations keep players from overheating. It’s a set that’s been popping up around the major leagues and for the second year in a row is showcased in the World Series. So what are you waiting for? 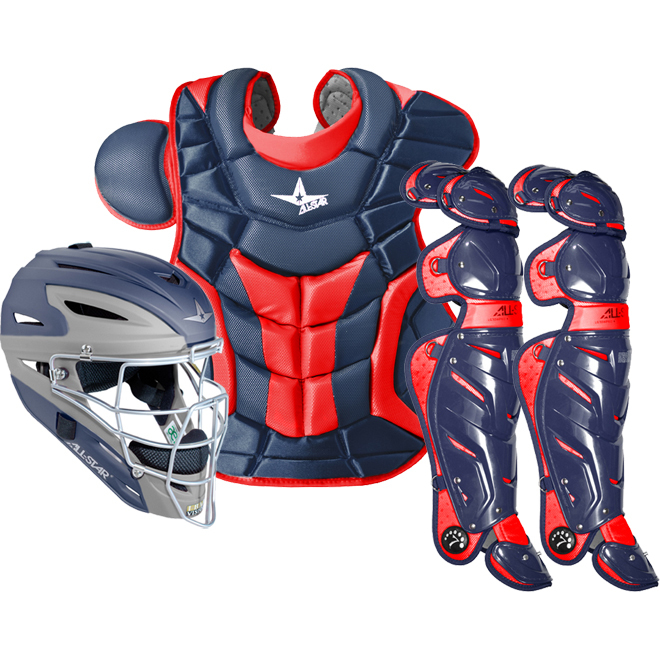 Also offered as a camo catcher’s set, the System 7 is one of the most popular pieces of equipment at Sports Unlimited. Check it out, along with our vast selection of catcher’s gear, today!